For the journal, see Neurology (journal). For the scientific study of the nervous system, see Neuroscience. "Neurological sciences" redirects here. For the journal, see Neurological Sciences (journal). Neurology (from Greek: νεῦρον (neûron), "string, nerve" and the suffix -logia, "study of") is a branch of medicine dealing with disorders of the nervous system. Neurology deals with the diagnosis and treatment of all categories of conditions and disease involving the central and peripheral nervous systems (and their subdivisions, the autonomic and somatic nervous systems), including their coverings, blood vessels, and all effector tissue, such as muscle. Neurological practice relies heavily on the field of neuroscience, the scientific study of the nervous system. 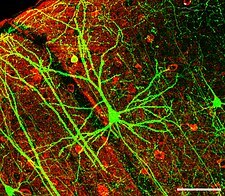 A network of dendrites from neurons in the hippocampus. A neurologist is a physician specializing in neurology and trained to investigate, or diagnose and treat neurological disorders. Neurologists may also be involved in clinical research, clinical trials, and basic or translational research. While neurology is a nonsurgical specialty, its corresponding surgical specialty is neurosurgery. Significant overlap occurs between the fields of neurology and psychiatry, with the boundary between the two disciplines and the conditions they treat being somewhat nebulous. A large number of neurological disorders have been described as listed. These can affect the central nervous system (brain and spinal cord), the peripheral nervous system, the autonomic nervous system, and the muscular system. The academic discipline began between the 16th and 19th centuries with the work and research of many neurologists such as Thomas Willis, Robert Whytt, Matthew Baillie, Charles Bell, Moritz Heinrich Romberg, Duchenne de Boulogne, William A. Hammond, Jean-Martin Charcot, and John Hughlings Jackson. Polish neurologist Edward Flatau greatly influenced the developing field of neurology. He published a human brain atlas in 1894 and wrote a fundamental book on migraines in 1912. 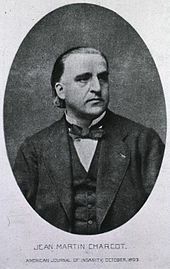 Jean-Martin Charcot is considered one of the fathers of neurology. Many neurologists also have additional training or interest in one area of neurology, such as stroke, epilepsy, neuromuscular, sleep medicine, pain management, or movement disorders. In the United States and Canada, neurologists are physicians having completed postgraduate training in neurology after graduation from medical school. Neurologists complete, on average, about 8 years of medical college education and clinical training, which includes obtaining a four-year undergraduate degree, a medical degree (DO or MD), which comprises an additional four years of study, then completing one year of basic clinical training and four years of residency. The four-year residency consists of one year of internal medicine internship training followed by three years of training in neurology. Some neurologists receive additional subspecialty training focusing on a particular area of the field. These training programs are called fellowships, and are one to two years in duration. Subspecialties include brain injury medicine, clinical neurophysiology, epilepsy, hospice and palliative medicine, neurodevelopmental disabilities, neuromuscular medicine, pain medicine, sleep medicine, neurocritical care, vascular neurology (stroke), behavioral neurology, child neurology, headache, multiple sclerosis, neuroimaging, neurorehabilitation. In Germany, a compulsory year of psychiatry must be done to complete a residency of neurology. In the United Kingdom and Ireland, neurology is a subspecialty of general (internal) medicine. After five to nine years of medical school and a year as a preregistration house officer (or two years on the Foundation Programme), a neurologist must pass the examination for Membership of the Royal College of Physicians (or the Irish equivalent) before completing two years of core medical training and then entering specialist training in neurology. A generation ago, some neurologists would have also spent a couple of years working in psychiatric units and obtain a diploma in psychological medicine. However, this requirement has become uncommon, and, now that a basic psychiatric qualification takes three years to obtain, the requirement is no longer practical. A period of research is essential, and obtaining a higher degree aids career progression. Many found it was eased after an attachment to the Institute of Neurology at Queen Square, London. Some neurologists enter the field of rehabilitation medicine (known as physiatry in the US) to specialise in neurological rehabilitation, which may include stroke medicine, as well as brain injuries. During a neurological examination, the neurologist reviews the patient's health history with special attention to the current condition. The patient then takes a neurological exam. Typically, the exam tests mental status, function of the cranial nerves (including vision), strength, coordination, reflexes, and sensation. This information helps the neurologist determine whether the problem exists in the nervous system and the clinical localization. Localization of the pathology is the key process by which neurologists develop their differential diagnosis. Further tests may be needed to confirm a diagnosis and ultimately guide therapy and appropriate management. Neurologists examine patients who are referred to them by other physicians in both the inpatient and outpatient settings. Neurologists begin their interactions with patients by taking a comprehensive medical history, and then performing a physical examination focusing on evaluating the nervous system. Components of the neurological examination include assessment of the patient's cognitive function, cranial nerves, motor strength, sensation, reflexes, coordination, and gait. In some instances, neurologists may order additional diagnostic tests as part of the evaluation. Commonly employed tests in neurology include imaging studies such as computed axial tomography (CAT) scans, magnetic resonance imaging (MRI), and ultrasound of major blood vessels of the head and neck. Neurophysiologic studies, including electroencephalography (EEG), needle electromyography (EMG), nerve conduction studies (NCSs) and evoked potentials are also commonly ordered. Neurologists frequently perform lumbar punctures to assess characteristics of a patient's cerebrospinal fluid. Advances in genetic testing have made genetic testing an important tool in the classification of inherited neuromuscular disease and diagnosis of many other neurogenetic diseases. The role of genetic influences on the development of acquired neurologic diseases is an active area of research. Some of the commonly encountered conditions treated by neurologists include headaches, radiculopathy, neuropathy, stroke, dementia, seizures and epilepsy, Alzheimer's disease, attention deficit/hyperactivity disorder, Parkinson's disease, Tourette's syndrome, multiple sclerosis, head trauma, sleep disorders, neuromuscular diseases, and various infections and tumors of the nervous system. Neurologists are also asked to evaluate unresponsive patients on life support to confirm brain death. Treatment options vary depending on the neurological problem. They can include referring the patient to a physiotherapist, prescribing medications, or recommending a surgical procedure. Some neurologists specialize in certain parts of the nervous system or in specific procedures. For example, clinical neurophysiologists specialize in the use of EEG and intraoperative monitoring to diagnose certain neurological disorders. Other neurologists specialize in the use of electrodiagnostic medicine studies – needle EMG and NCSs. In the US, physicians do not typically specialize in all the aspects of clinical neurophysiology – i.e. sleep, EEG, EMG, and NCSs. The American Board of Clinical Neurophysiology certifies US physicians in general clinical neurophysiology, epilepsy, and intraoperative monitoring. The American Board of Electrodiagnostic Medicine certifies US physicians in electrodiagnostic medicine and certifies technologists in nerve-conduction studies. Sleep medicine is a subspecialty field in the US under several medical specialties including anesthesiology, internal medicine, family medicine, and neurology. Neurosurgery is a distinct specialty that involves a different training path, and emphasizes the surgical treatment of neurological disorders. Also, many nonmedical doctors, those with doctoral degrees(usually PhDs) in subjects such as biology and chemistry, study and research the nervous system. Working in laboratories in universities, hospitals, and private companies, these neuroscientists perform clinical and laboratory experiments and tests to learn more about the nervous system and find cures or new treatments for diseases and disorders. A great deal of overlap occurs between neuroscience and neurology. Many neurologists work in academic training hospitals, where they conduct research as neuroscientists in addition to treating patients and teaching neurology to medical students. Neurologists are responsible for the diagnosis, treatment, and management of all the conditions mentioned above. When surgical or endovascular intervention is required, the neurologist may refer the patient to a neurosurgeon or an interventional neuroradiologist. In some countries, additional legal responsibilities of a neurologist may include making a finding of brain death when it is suspected that a patient has died. Neurologists frequently care for people with hereditary (genetic) diseases when the major manifestations are neurological, as is frequently the case. Lumbar punctures are frequently performed by neurologists. Some neurologists may develop an interest in particular subfields, such as stroke, dementia, movement disorders, neurointensive care, headaches, epilepsy, sleep disorders, chronic pain management, multiple sclerosis, or neuromuscular diseases. Some overlap also occurs with other specialties, varying from country to country and even within a local geographic area. Acute head trauma is most often treated by neurosurgeons, whereas sequelae of head trauma may be treated by neurologists or specialists in rehabilitation medicine. Although stroke cases have been traditionally managed by internal medicine or hospitalists, the emergence of vascular neurology and interventional neuroradiology has created a demand for stroke specialists. The establishment of Joint Commission-certified stroke centers has increased the role of neurologists in stroke care in many primary, as well as tertiary, hospitals. Some cases of nervous system infectious diseases are treated by infectious disease specialists. Most cases of headache are diagnosed and treated primarily by general practitioners, at least the less severe cases. Likewise, most cases of sciatica are treated by general practitioners, though they may be referred to neurologists or surgeons (neurosurgeons or orthopedic surgeons). Sleep disorders are also treated by pulmonologists and psychiatrists. Cerebral palsy is initially treated by pediatricians, but care may be transferred to an adult neurologist after the patient reaches a certain age. Physical medicine and rehabilitation physicians also in the US diagnosis and treat patients with neuromuscular diseases through the use of electrodiagnostic studies (needle EMG and nerve-conduction studies) and other diagnostic tools. In the United Kingdom and other countries, many of the conditions encountered by older patients such as movement disorders, including Parkinson's disease, stroke, dementia, or gait disorders, are managed predominantly by specialists in geriatric medicine. Clinical neuropsychologists are often called upon to evaluate brain-behavior relationships for the purpose of assisting with differential diagnosis, planning rehabilitation strategies, documenting cognitive strengths and weaknesses, and measuring change over time (e.g., for identifying abnormal aging or tracking the progression of a dementia). In some countries, e.g. US and Germany, neurologists may subspecialize in clinical neurophysiology, the field responsible for EEG and intraoperative monitoring, or in electrodiagnostic medicine nerve conduction studies, EMG, and evoked potentials. In other countries, this is an autonomous specialty (e.g., United Kingdom, Sweden, Spain). Although mental illnesses are believed by many to be neurological disorders affecting the central nervous system, traditionally they are classified separately, and treated by psychiatrists. In a 2002 review article in the American Journal of Psychiatry, Professor Joseph B. Martin, Dean of Harvard Medical School and a neurologist by training, wrote, "the separation of the two categories is arbitrary, often influenced by beliefs rather than proven scientific observations. And the fact that the brain and mind are one makes the separation artificial anyway". Neurological disorders often have psychiatric manifestations, such as poststroke depression, depression and dementia associated with Parkinson's disease, mood and cognitive dysfunctions in Alzheimer's disease, and Huntington disease, to name a few. Hence, the sharp distinction between neurology and psychiatry is not always on a biological basis. The dominance of psychoanalytic theory in the first three-quarters of the 20th century has since then been largely replaced by a focus on pharmacology. Despite the shift to a medical model, brain science has not advanced to the point where scientists or clinicians can point to readily discernible pathologic lesions or genetic abnormalities that in and of themselves serve as reliable or predictive biomarkers of a given mental disorder. The emerging field of neurological enhancement highlights the potential of therapies to improve such things as workplace efficacy, attention in school, and overall happiness in personal lives. However, this field has also given rise to questions about neuroethics and the psychopharmacology of lifestyle drugs. ^ ACGME (1 July 2016). "ACGME Program Requirements for Graduate Medical Education in Neurology" (PDF). www.acgme.org. Archived from the original (PDF) on 13 January 2017. Retrieved 10 January 2017. ^ a b "Working with Your Doctor". American Academy of Neurology. Retrieved 28 October 2012. ^ "Medical Practitioners Act, 1927". Irishstatutebook.ie. 28 May 1927. Retrieved 30 March 2015. ^ "Medical Council – Medical Council". Medicalcouncil.ie. 15 February 2010. Retrieved 30 March 2015. ^ "Neurologist Profie" (PDF). Education Portal. Retrieved 23 February 2017. ^ "ABMS Guide to Medical Specialties" (PDF). American Board of Medical Specialties. Retrieved 26 November 2012. ^ "Who Can Diagnose ADHD?". Additudemag.com. 19 July 2007. Retrieved 3 March 2014. ^ "American Clinical Neurophysiology Society". Acns.org. Retrieved 30 March 2015. ^ "American Board of Clinical Neurophysiology, Inc". Abcn.org. Retrieved 30 March 2015. ^ "ABEM – Home". Abemexam.org. Retrieved 30 March 2015. ^ "Specialty and Subspecialty Certificates". Abms.org. Retrieved 30 March 2015. ^ Martin JB (May 2002). "The integration of neurology, psychiatry, and neuroscience in the 21st century". The American Journal of Psychiatry. 159 (5): 695–704. doi:10.1176/appi.ajp.159.5.695. PMID 11986119. ^ Hamilton Roy (2011). "Looking at things in a different perspective created the idea of ethics of neural enhancement using noninvasive brain stimulation". Neurology. 76 (2): 187–193. doi:10.1212/WNL.0b013e318205d50d. PMC 3030230. PMID 21220723.